Loom II is a major upgrade to the original, pushing the boundaries of additive synthesis. Loom II is ideal for all skill levels. Whether you’re starting out and just experimenting in this space or you’re a bonafide expert, the instrument grows with you. Loom II is an award-winning modular additive synthesizer with a shape-shifting Morph Pad that makes it easy to create rich, swirling and captivating sounds. The original Loom was considered a triumph of its time when it was launched. Now, Loom II builds on this with unique and powerful new features as requested by our loyal users. 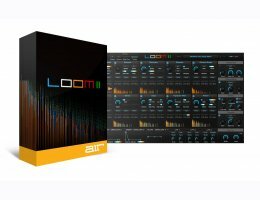 Loom II takes a unique modular approach to additive synthesis, a synthesis technique that involves combining simple waveforms together to create complex sounds, by enabling anyone to select from and combine 34 editable modules. Create anything from wobbles, organs, ethereal pads, ambient soundscapes and so much more. The programmable Morph Pad brings your Loom II patches to life by morphing between user-defined variations of your patch, adding motion and momentum that continuously evolve. Expanded to 8 voices by popular request! Spectral Noise section allowing a secondary oscillator to replace or enrich the additive spectrum (created with the Sine Oscillator) with a noise spectrum. This is truly revolutionary in the additive world. Your creativity is the only limit to what is possible! 2 additional Subharmonic Optional Partials bellow the normal spectrum. 500 all-new patches covering a wide range of sounds designed by acclaimed sound designers Richard Devine and Mark Ovenden. All original 350 patches re-mastered taking advantage of the new features.